First pic I've seen of a VFA-147 F-35C. I'd like to see the CAG jet. From a modelers perspective I hope at some point it has as much color as USMC's F-35 squadron CO jets. "An F-35C Lighting II Joint Strike Fighter maneuvers aboard USS Abraham Lincoln (CVN-72) on Monday during operations in the Atlantic on Aug. 27, 2018. USNI News Photo"
I used to be able to log in to DVIDS to download high quality photos but not today - not with three browsers I cannot? Went to another photo in series and now I can log in - I dunno…. Surprised to get back from 5 weeks at sea and not see a single thread about this.......last 2 weeks we just did F-35 "OT-1". 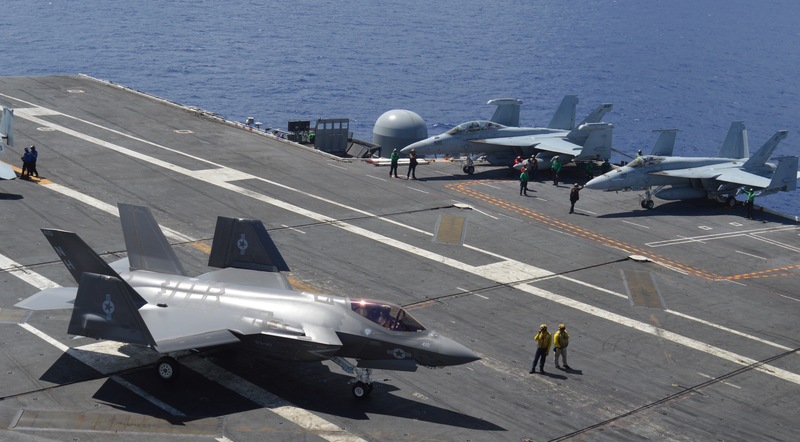 First cyclic CVN F-35 ops in history. Yes, they howl a little more than our Rhinos (much like a Viper), and their formation lights are configured in a weird way so as to make them look like they have cat eyes on the PLAT cam. And yes, Top Gun 2 film crew was there as well, shooting all over the place. Maybe my 15 mins in fame is yet to come.....think I bagged a (settle)/AR OK 2 wire the sunset they were filming at the same time I was flying. USN has been on info lock down for many months now - before the USAF did same - however the USAF are supposed to come out of their self imposed media cloistering (for OPSEC training for spokespeeps so some can LURN HOW TO SPELL LIGHTNING FOR goodness sake!) soonish like. Interesting to know. How 'bout your goodself? What mode do you usually use and what mode were you using for the settle? Awesome stuff! In my head any sunset 2-wire Rhino trap I see in the movie will be you! spazsinbad wrote: Interesting to know. How 'bout your goodself? What mode do you usually use and what mode were you using for the settle? I was a "Path" guy myself, like most other cruise experienced folks. We got most of our FNG's there by the end of the det as well. It is a little bit different muscle memory (little power call is easily overdone for example) but it is as lazy as you can get during a night recovery..........it feels really uncomfortable to just let the ball sit there perfectly centered, but it actually works......though 5 wet tends to gob on a bunch of power at the ramp when the ship is making its own wind, i.e. burble. Click out of auto throttles and it is fixed. I was in the 5W on said sunset, I'm sure they will filter out the tanker recovery sadly But I got a little lazy at the ramp and settled. Think that was my only 2 wire, all the others were either 3 (mostly) or 4 on occasion if I got tall in close. Basically you just watch lineup and make a couple glideslope corrections if you begin at an on and on start. Super easy. Pretty much the entire airwing, save the E-2, was getting nothing but OK-3's, to the point where they had to strip the 3 a little more regularly than normal. We also were the first airwing to use the "extended landing pattern" during the day/case 1/2. Descend to 450 feet aft of the bow, same abeam distance (1.2-1.3), then turn from downwind at either 1.7 NM if own interval, or with interval at the 9:30 position if someone is ahead of you. Makes for about a mile straight away with lineup solved, just waiting to intercept GS from below, and if you are flying PLM Path or Rate, it is way easier to get to an on/on start than what we used to do with the traditional approach turn. More repeatable if you will. Makes breaking the deck timing a little more nebulous though. I unnerstood most of your jargon FiveWet would be the TANKER I guess soon (by 2024 bloody hell) to be replaced by the BOING! MQ-25. So at 450 feet when you turn base do you stay level to pick up the ball round the last part of the turn? I have often claimed to have done 400 feet carrier circuits which seemed easier when level turning base rather than NATOPS 600 feet descending base turn in an A4G - long ago. Shorter straightaways left less time for stuff ups. spazsinbad wrote: I unnerstood most of your jargon FiveWet would be the TANKER I guess soon (by 2024 bloody hell) to be replaced by the BOING! MQ-25. So at 450 feet when you turn base do you stay level to pick up the ball round the last part of the turn? Heheh - Greenie Board - the walk of shame for sprogs! (nuggets/newbies) Intercepting from below is OK? Anyway our A4G squadron was copying the SEA VENOM of previous times. The Venom pilot view over the bulbous nose was not good. The Observer in the right hand seat called out the airspeed in one knot increments so that the pilot did not have to look inside. Tight curving circuits more or less ALL THE TIME from the break helped pilot view in the left turn. Short finals helped when there was NO LSO. This is aboard HMAS Melbourne from c. 1957 to 1966. These guys probably got away with a lot; so when the USN trained LSOs came along in the A4G era there were initially horrendous shouting matches from the olden ones. My CO even arrested an A4G when the mirror was covered up! Talk about deck spotting. The MCO Mirror Control Officer sat behind the mirror while the LSO was caught out from the quick A4G return, discovering error after. I found the new descending turn from 600 foot base difficult to master at first, we transitioned about halfway through the first cruise IIRC. Anyway as the most junior pilot on VF-805 I knew bugga all about deck landings (my 1st were in the A4G). Perhaps different to your method with level approach to push over was we turned level but we could see the ball in our MELBOURNE MIRROR about halfway around the level turn, so we transitioned to flying the ball during the turn to finals. Can't recall how long the groove was then but it was short & sweet. Or so I thought until the LSO debrief. MIRRORS are curved so view angle wide & with only a 5.5 degree angle deck things could be as tight as, line up no probs. Did you happen to hear what (nick)name they were calling it around the boat? This is the first time we've had someone on the boards who could have first hand knowledge. sprstdlyscottsmn wrote: Did you happen to hear what (nick)name they were calling it around the boat? This is the first time we've had someone on the boards who could have first hand knowledge.